LeEco has announced on August 19 that it has recieved 10,000 registrations in one day for the flash sale of its Super3 series TVs which is to be held on August 26. 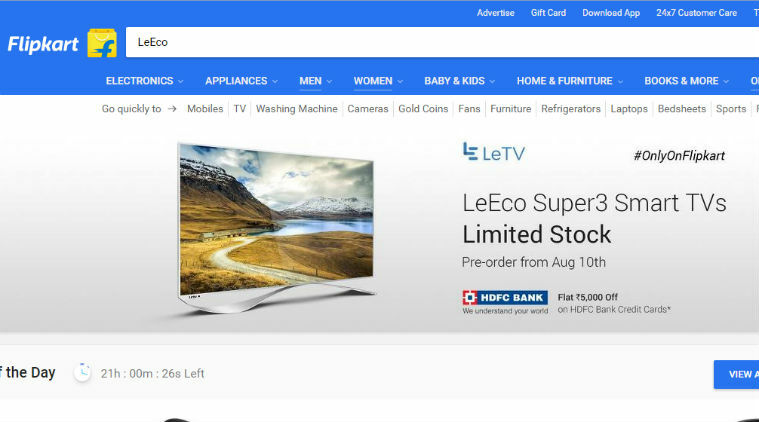 Consumers can register for the Super3 TVs by LeEco from Flipkart and LeMall which is LeEco’s own online platform, till August 26. Recently the company had launched in India, the Super3 TV range in three new variants of 4K TVs. Available in screen sizes which range from 55 inch to 65 inch, the Super3 TV series run LeEco’s own EUI 5.6 with its own content ecosystem. The registration numbers reflects of the brand’s high credibility among Indian consumers and the formidable reputation the SuperTVs enjoy globally. One of the key reasons for LeEco’s soaring popularity is the fact that its nearest competitor in the 65-inch category with similar specs retails at almost three times the cost. The TVs are powered by a quad-core CPU and has a memory space of 3 GB RAM and 16 GB ROM, and supports DTS and Dolby sounds. Be the first to comment on "LeEco Super3 TV Flash sale on 26th August, 10000 registration on Day 1"